The holidays are upon us! Can you believe it? I think the season's arrival calls for a special treat. Ice Cream Soda is actually a specialty of my mom's; I don't remember a week going by when I was younger that I didn't have one (I mean, it was the perfect accompaniment to my weeklyTGIF Pizza Party after all). It's such a delicious, nostalgic treat, and it only takes two ingredients: Vanilla Ice Cream and Vernor's Ginger Ale ( and I insist you use Vernor's). The ginger ale gives the ice cream almost a freeze dried texture and creates a yummy, bubbly foam on top. 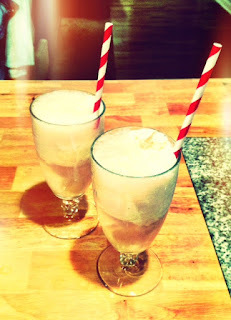 Not only is Ice Cream Soda a fun dessert for adults and kids alike, but also make for a lovely finale at a dinner party. No matter what I make, I find that people are almost always too full for dessert (ok, so I may be guilty of refilling the cheese plate until it's gone, but who am I to judge how much cheese 5 people can consume?!). Not the case with ice cream soda! The first time I made it for friends was after my first annual ladies gift exchange a few years ago. I made Julia Child's famous boeuf bourguignon and everyone was about to burst when I mentioned dessert. Most of the ladies politely declined, but as soon as I brought out a few Ice Cream Soda's on a tray, their eyes perked up! It's such a refreshing, sweet treat, it really is hard to resist. Be sure to serve it up with both a straw and spoon (I found these red striped straws at Sur la Table). Merry Sipping!